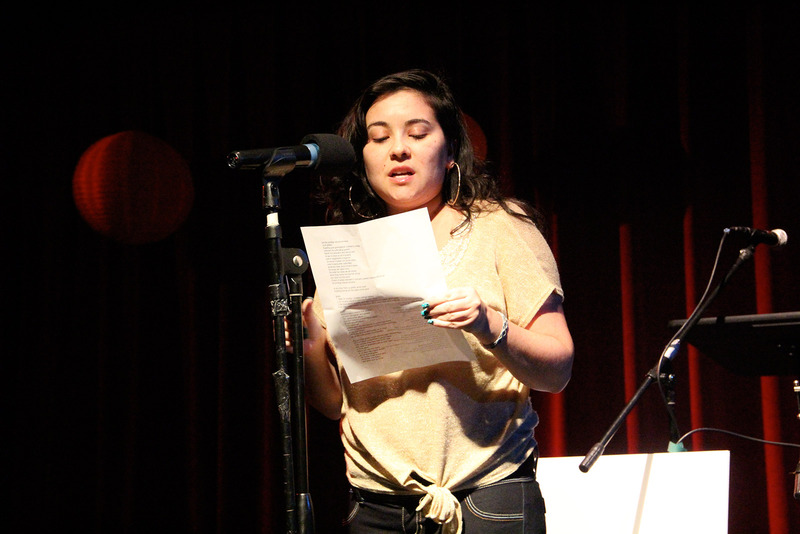 Dyanna Loeb aka Dyna*Mic reads her piece at the Iluminando El Camino event. “We really need to know our history as immigrants and stand in solidarity with other immigrants,” she said. At the beginning of Thursday night’s performance at the Mission Cultural Center, audience members were asked to raise their hands if they were immigrants or the children or grandchildren of immigrants. Nearly every hand in the crowd went up. The event, titled “Iluminando El Camino” or “Lighting the Way,” presented by the Jewish Community Relations Council, brought together diverse performers, each with their own story of immigration. The performance as a whole was a reminder that storytelling can be activism, a way to bring a community together to share in the loneliness and struggle that come from uprooting your life and starting a new one. Navarrete spoke of his struggles in the new country, making jokes about American food – “I don’t like the corndog very much. The taste confuses me.” — and speaking “English” with his sister. “Really, it’s just Spanish with our version of American accents,” he joked. Navarrete, who is undocumented, attended college at San Jose State and went on to work as a high school Spanish teacher. “I hear my undocumented students talk about their struggles and I want to scream my truth,” he said, his voice shaking with the emotion behind the words. Aviva Frank told her story of moving to Israel from the United States, and compared the journey to the one her grandparents had made from Eastern Europe to the United States. “Many of the reasons why I moved to Israel were the same reasons why they had ventured in boats for weeks to come here,” she said. There were differences, too, she noted. Her grandparents moved out of fear, fleeing with few possessions, while she moved by choice, arriving with suitcases full of belongings. Her grandparents were forced to change their names, while Frank chose to change hers. The recession forced Frank to move back to the United States, and she spoke frankly of the complex feelings that come with being an immigrant: the doubt she felt in her new country, the struggle of working to support herself, the disappointment she felt in herself when she had to move back. Other performances focused on memories of home and community. Sharron SK Williams shared stories of her youth in Belize, each one – gossiping around the well, breaking coconuts and bananas on a wooden grater, protecting the young ones from snakes — told with vivid detail, as if it had happened yesterday. The piece, she said, was inspired by her time living in Dhakar, Senegal, when she went to visit the “point of no return doorway,” part of a memorial and museum of the trans-Atlantic slave trade. Rodolofo Quetzal, whose full name is Rodolofo Quetzal 5 de la Bahía el Lion del Poesia, read a piece in Spanish called “Vive el Emigrante,” which invoked the history of people immigrating to find freedoms and a better life. Dr. Natalia Ramirez shared thoughts and short snippets of the experience of living in a new place and the longing for home. Dyanna Loeb, aka Dyna*Mic, told a story about helping a group of fifth-graders relate to their own immigrant histories in order to overcome prejudice and understand the communities around them. “I think it’s important to recognize both the challenges immigrant communities face and also the unique ways that having such a diverse community enriches San Francisco,” said organizer Laura Rumpf. So this story is not “Immigrants” but “Illegals”! There really is a major difference; but then California fails to recognize that. This is one major reason the debt ceiling is so high in California. Good luck in the new year, maybe someone will wise up and get it right for a change. Way to disrespect your neighbors and their accomplishments. Todos somos illegales. We are all illegal.